The prompt for today’s #reverb16 calls for me to channel the warmth of the tropics (despite our New England locale). Prompt #6: Sunny Surprises. Most of North America starts to get frosty and cold this time of year. If you had an unusually warm (tank tops and flip flops warm!) day unexpectedly and didn’t have to work, what would you do? If you could send yourself to any sunny and warm (tank top & flip flops warm) day in your past, what day would it be? Because for me that would be easy. I’d start by going back in time to July 1, 2012 (if I had to pick just one day). Mom was thirsty! And not paying any attention to my attempt to take my sister’s family photo. 2012 was the year my parents celebrated their 50th anniversary. My sibs & I hosted a party for them in my hometown in Iowa. But we ALSO planned a full-family getaway to the Wisconsin Dells! Not an easy task with 6 kids and 16 grandkids! My mom LOVED the summer! She had been a teacher, so summer for her equaled freedom. My dad loves summer too, because that means GOLF, and warm weather and golf and the pleasure of making the lawn gorgeous again, and lots of watermelon and don’t forget, golf. Summer in the Midwest is really, truly summer. Cornfields, watermelon, humidity, softball, mosquitoes, thunderstorms, ice cream and bike trails. No summer camps needed. 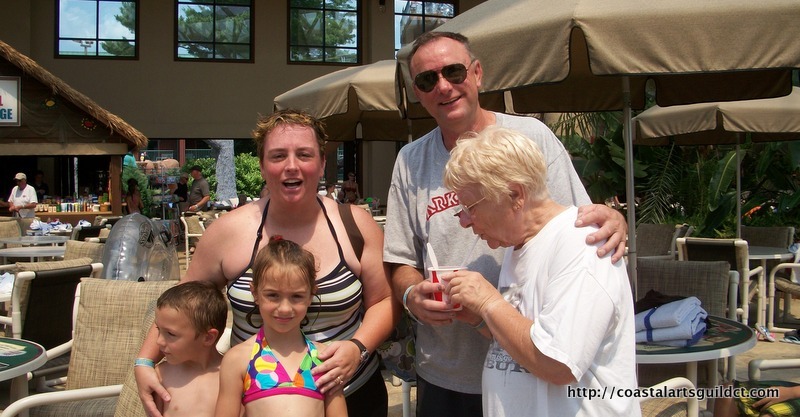 Our family days at the Dells were especially fun, for a few reasons. First, it was ALL of us. Making dinner together, chatting, going down tandem waterslides together. Second, my kids were still little and not great swimmers yet. But we had the pleasure of sharing them joyfully with their amazing older cousins, aunts, uncles. Sure I could have gone for the more obvious choice of our trip to Disney last December… but spending another July day with my mom together with her family would be pure heaven.